This is a modified version of the recipe found in Carla Hall’s book, “Carla’s Comfort Foods”, which itself is a modification of another recipe. My changes: Using soy (aka “groundless groundbeef”) and seitan (Field roast sausage-style links) instead of bulgar wheat (and eliminating the stock). Substituting creme fresh (Trader Joe’s creme fresh) for most of the ricotta and yogurt. Why? less carbs and more importantly, we had those ingredients laying around. 1. Slice the eggplant into thin long slices. 3. While that’s broiling, make your tomato sauce. Sautee onions. Combine tomato pure, all spice, cinnamon, and oregano. Cook on medium, covered (so it doesn’t splash). 4. In a food processor, grind up the sausage links. Sautee in a skillet until lightly browned. 5, Make your bechamel: combine creme fresh, ricotta, eggs, nutmeg, and a dash of cinnamon. 6. In a casserole dish, make 3 layers: put down sauce, then eggplant, fake meat, then bechemel. repeat 2x. 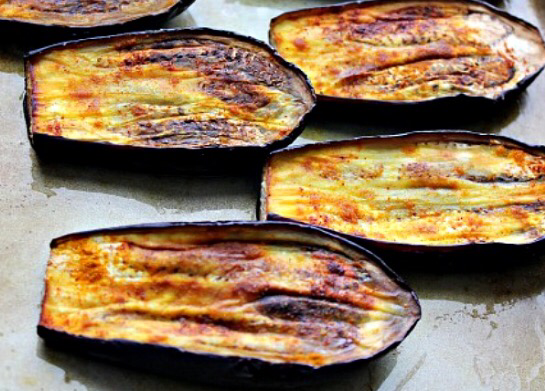 This entry was posted in low carb, main dish, Recipes, vegetarian and tagged broiler, eggplant, moussaka, summer, vegetarian. Bookmark the permalink.